This Sunday during the Super Bowl we all love to watch the fun commercials, right? Well keep an eye out for Funky Amanda in the CBS 58 commercial branding their newscast! 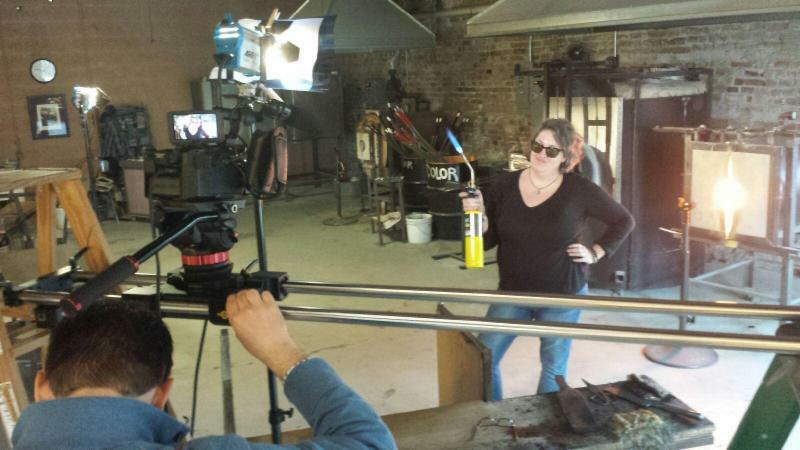 They came and filmed at our sister business – Hot Shop Glass….and we are pretty sure we’ll get a second of air time during the big game. It was a lot of fun. Amanda made sure she had lots of bracelets on the arm with the torch. Beads need air time too! UPDATE: Here’s the link to the commercial! ~We are so grateful to have been the host site for Milwaukee Channel 12 Kathy Mykelby’s Tuesday’s Child interview. ~Bead & Button Magazine’s February Issue features me in their Artist Spotlight section. Honored beyond words! Stop in and grab a copy, or check out the digital version here. ~And finally we welcomed Milwaukee Channel 6 reporter Laura Langamo to downtown Racine — for a live broadcast from Funky Hannah’s and our neighbor Plumb Gold! We showed Laura how to beat the winter blues and add some sparkle to the world! She’s super fun! Click here for two videos of the fun we had!